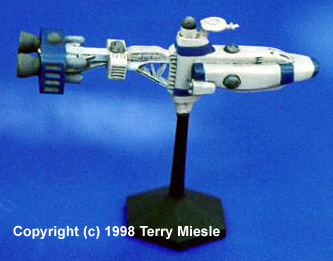 This is a nice little miniature of a very attractive cruiser. It's a design which doesn't always get it's fair shake on the show but looks quite nice when placed in formation with the other cruisers. I've heard tell of the engine block arriving twisted, though mine wasn't. (Mine was; easily fixed with a large pliers and gentle pressure. I also had a huge pour stub that required filing - Ed.) The casting was crisp, easily cut and glued, free of blemishes and overall quite impressive. 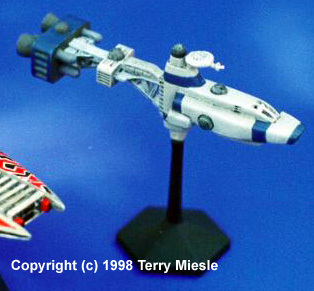 It is probably going to be the easiest capital ship miniature in the B5 Wars series to assemble, barring the Vree Saucers when they are released. As such, it should be the best beginner project for anyone new to metal miniatures. Many of the design and coloration themes are similar to the Omega Destroyer, so this review will be short. The pieces you will need to glue on are 3 engine nozzles, which just need to be cut and the joint cleaned, and a saucer section which is added with design up, small dish antenna below, facing forward. I added all of these pieces before priming. I added the pylon right away, but did not yet glue it to the base, though you certainly might want to do it now. Engine Block ends and Nozzles, gun turrets, nose inset: TMM Eruo I grey. I applied the base grey, a little detail painting with different greys picked finished out the rear section, sealed it with TMM Dullcoat, then applied a black wash. I tried to confine this to the intersections of the hull areas and detailed regions. After the washes and another dullcoat, I drybrushed with a couple coats of slightly lightened grey to add texture. I then applied the blue bands with Tamiya Flat blue. Later, upon viewing additional video ("Voice in the Wilderness," and "In the Beginning") I realized the engine block in the show is grey and the "silos" facing forward are blue, and the saucer disk on top should be at least partially blue - oh, well. It looks good like this too. I applied several different grey shades to the aft support section to provide contrast, and painted the nozzle interior TMM flat black. The blue bands were handpainted, then the grey and steel hull details were added. The turrets were painted TMM Euro I Grey, and additional blackwash added to darken the trench around them. Another dullcoat (make sure the acrylic Blue has had time to cure - several days). The aft facing batteries got TMM Steel paint, and I painted the front "balls" and the fore battery TMM Chrome Silver. Again, like the Omega, I left insignia off. I plan to add this later. Of course, the base and pylon get blackened. In addition to Terry's steps above, I used lengths of fine brass wire to replicate the antennae that sprout from the bow. Drill a small hole for the base of the wire and use a drop of superglue to affix each one - Ed.